When I was a child, sunburns were common. We used suntan lotion to get tans not to protect us from the sun. Fortunately for today’s children, we know better. Sun damage in childhood can cause health problems as adults. Although it is important to expose your children to natural sunlight for vitamin absorption, these periods should be limited and occur during off peak hours. Which sunscreens are best for children? Since kids are more vulnerable to damage caused by the sun and to harmful effects of chemical exposure, you want to make sure you choose a sunscreen that is rated highly in terms of both effectiveness (against both UVA and UVB radiation) and safety. Use EWG’s guide to help you find one. If your child is going to be swimming or playing in the water look for a sunscreen that says it is water resistant. Avoid sprays, powders and products with bug repellant. Make sure to apply sunscreen generously before going out and reapply often. (Don’t believe claims that a product will remain effective for a certain period of time, as these are not always reliable.) Infants under 6 months need special protection Ñ at this age, a fair-skinned baby does not have melanin proteins for sun protection and needs to be kept out of the sun. The AAP recommends that you avoid using sunscreen on children younger than 6 months unless protective shade and clothing are not available. In this case you can apply a minimal amount to exposed skin (AAP 2008). Remember that sunscreen is just one part of a sun-healthy lifestyle. Limiting sun exposure and wearing protective clothing are even more important than wearing sunscreen. My family has recently tried Azur® Advanced Pro-Cellular Sunscreen. As recommended by EWG, this product’s active ingredients are zinc oxide and titanium dioxide. 84 percent of sunscreens either contain toxic active ingredients that are endocrine disruptors, or they don’t provide adequate protection from the sun. 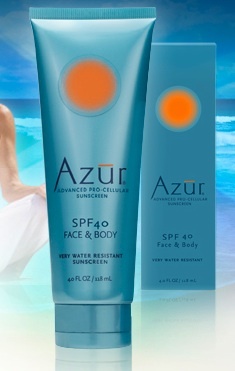 Azur comes in SPF 30 and 40 for ultimate protection. As far as the other ingredients in Azur, I am not sure of their toxicity, as EWG has yet to rank Azur, but the company assures it is “chemically inert”. In addition to zinc oxide and titanium dioxide, Azur uses vitamins to keep your skin healthy and protect if from the sun. Skin care experts have long known that vitamins can have a very positive effect on the skin. In fact, healthy skin requires a number of vitamins to keep it resilient, smooth, hydrated, soft and unlined. Vitamins A, C and E are key. Vitamins C and E, especially, are powerful antioxidants that help prevent skin damage from free radicals. Free radicals are a dangerous form of oxygen (from pollution and sunlight, among others) that can break through the membrane that protects skin cells to cause inflammation as well as visible lines and wrinkles. Vitamin A works to help prevent sun damage while vitamin C accelerates skin healing. There is also scientific evidence that vitamin C may pass through the layers of skin to help heal tissue damaged by burn or injury, making it ideal for sun care. I find Azur sunscreen to be heavy, which I like and dislike. I like the heaviness because I know I have applied it thoroughly, but the thickness feels oily on my face, although it has not caused any breakouts. Azur® Advanced Pro-Cellular Sunscreen really does work; I have tested it on all members of our family. It is also tear-free, which makes it perfect for the little ones. I couldn’t find the ingredients list on their website. Would you be willing to post it? Thanks for introducing us to this new suncare line. Terri: here are the ingredients that are a concern – and there are quite a few of them. This is neither organic nor safe. This contains nano – Titanium which is bad stuff.. There are a lot of bad chemcals in this too. My main concern is health which is why I looked at Azur. It turns out that Azur is one of those products that bills itself as natural and good for you but is full of synthetics and lots of toxic ingredients. A wanna-be. Like many other kids, I was not careful in the sun when I was a kid. It’s never too late, but sun protection starts at infancy. Nowadays, hopefully the parents have sufficient knowledge and know what to do. I also learned a lot at this site http://www.sun-protection-and-you.com/organic-sunscreen.html which shows you additional information about sun protection and natural sunscreen.